These photos were taken in my besties front yard bush garden. The previous owner planted some trees that Koalas can feed and sleep in. Koalas sleep a lot of the time and are nocturnal generally. When he is in the trees, he can be heard calling, a sound you can never forget. There are animals everywhere, especially around my place. Some are small, some are large but most don’t mind having their picture taken, as long as I am quick. 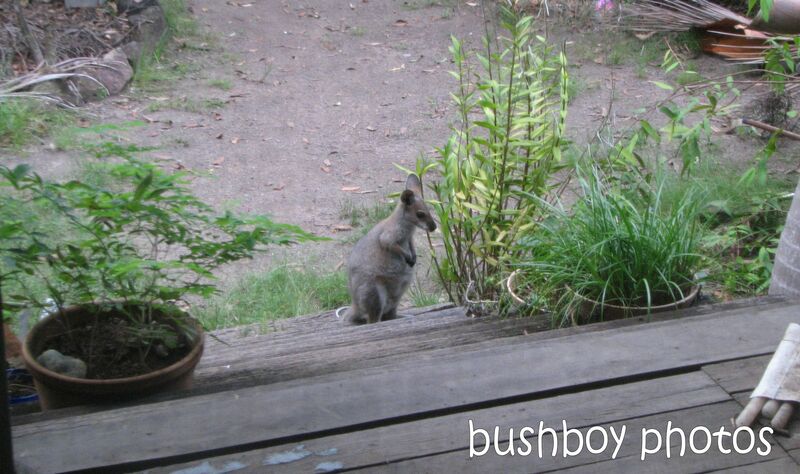 It is certainly a privilege to have them around, not only in the bush but sometimes close to the house. 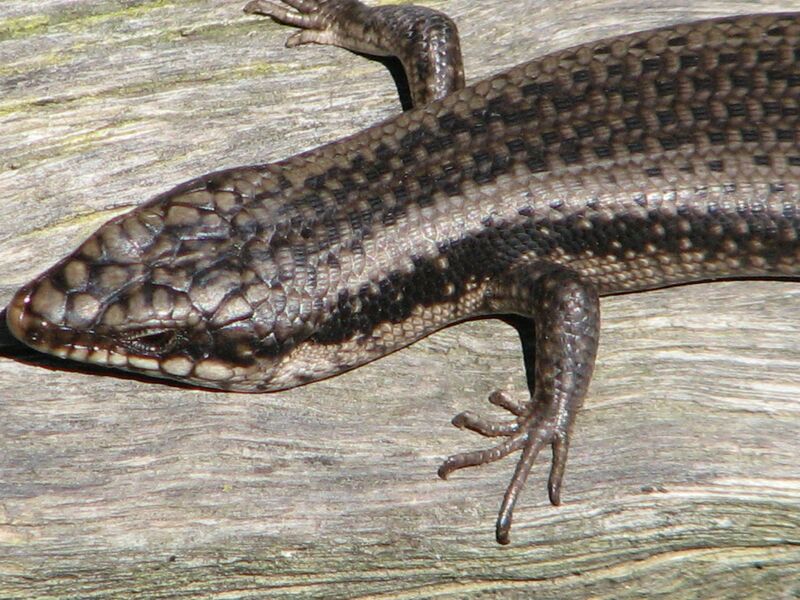 The garden always has a wallaby eating or resting, there is always lizards of course, or should I say skinks and sometimes a snake or two will rustle through the undergrowth. 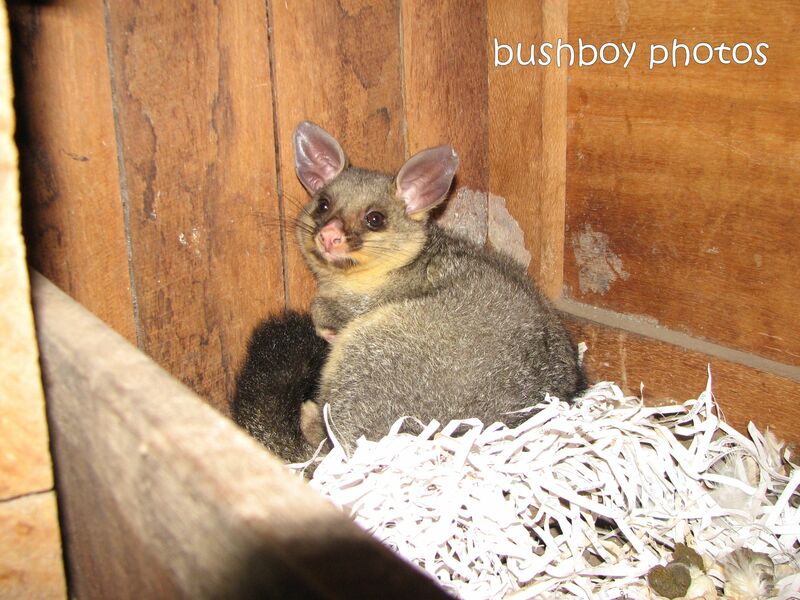 I have heard Koalas at night but not seen them but possums are always somewhere around even in the chook house. 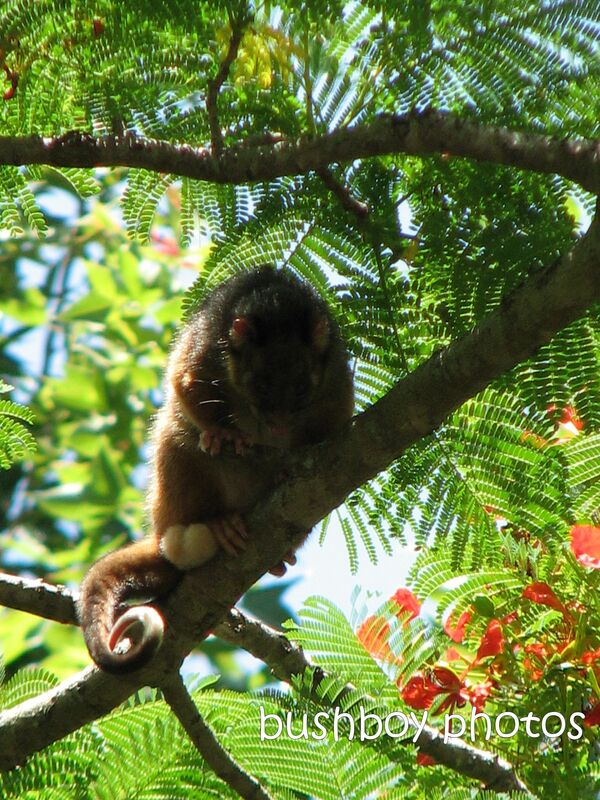 Other possums, that aren’t here but at my besties place, are the Ringtailed Possums. This bloke was high in the tree and it takes balls to climb high. At her place at least I can see the Koala!!! This bloke was in the front garden about 10 meters from the house. There are small bats somewhere around, in hollows and sometimes they stop inside for the night. Summertime, the windows and doors are open to catch the breezes and the little micro bats often whizz around sweeping up moths and other bugs attracted to the lights. This Lesser Eared Bat found a box to rest in. 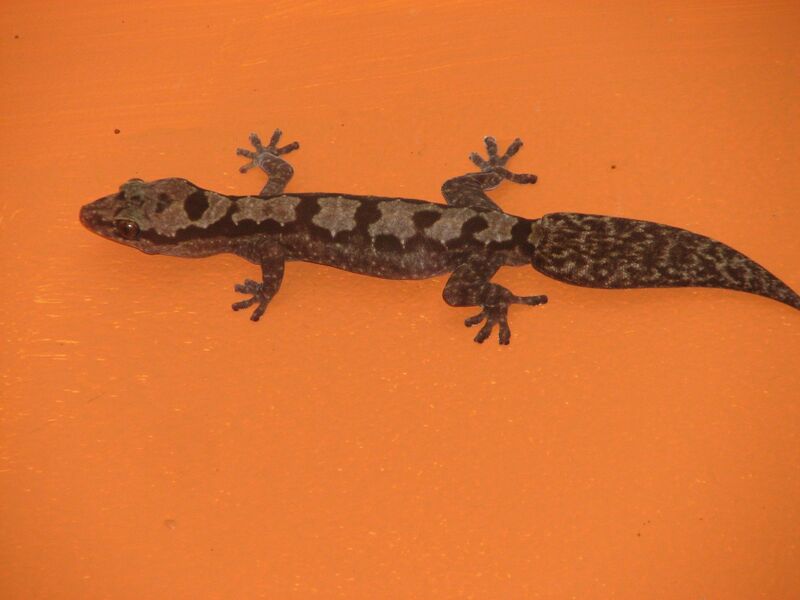 Geckos have many a spot around the house. Most of the pictures on the walls have a gecko or two behind them, When they get frisky, the pictures jump and bump on the walls. This Velvet Gecko was stalking a moth and didn’t really want my attention. Outside the skinks have the run of the verandas, garden and basically everywhere, all through the bush. I have a recycling and garbage area, as I don’t have a garbage service, where I store all my garbage and recycling until I get a good sized load to take to the transfer station in town. I open the bale flaps very slowly each time as there is usually a frog or spider under there. 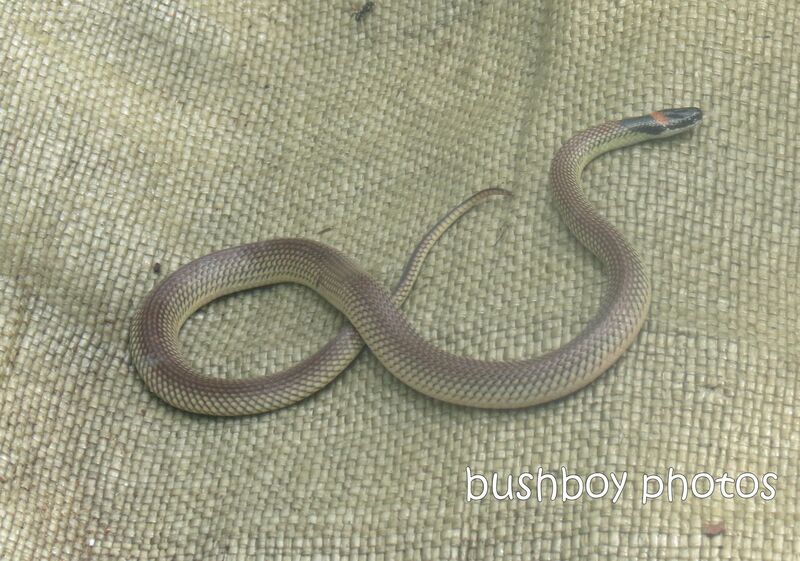 This day as I opened the bale up, there was a small Red Naped Snake warming under the flap. One of the hard parts of bush living is life and death. I love my chooks but so do a lot of others who mainly love them as dinner. 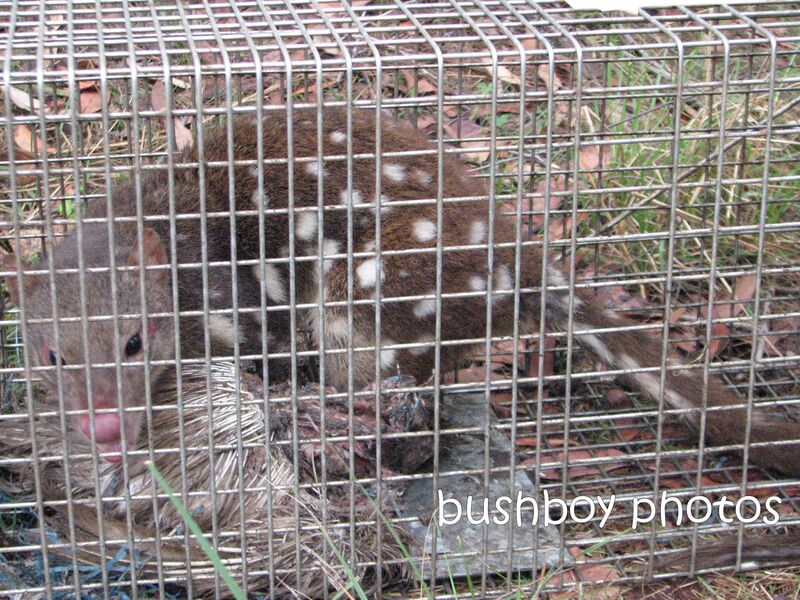 Over the years I have lost a few to Spotted Tail Quolls. One time, after around 6 chooks were killed, I took a carcass and put it into a trap hoping to get the bugger and take him for a ride up the mountain to the National Park. 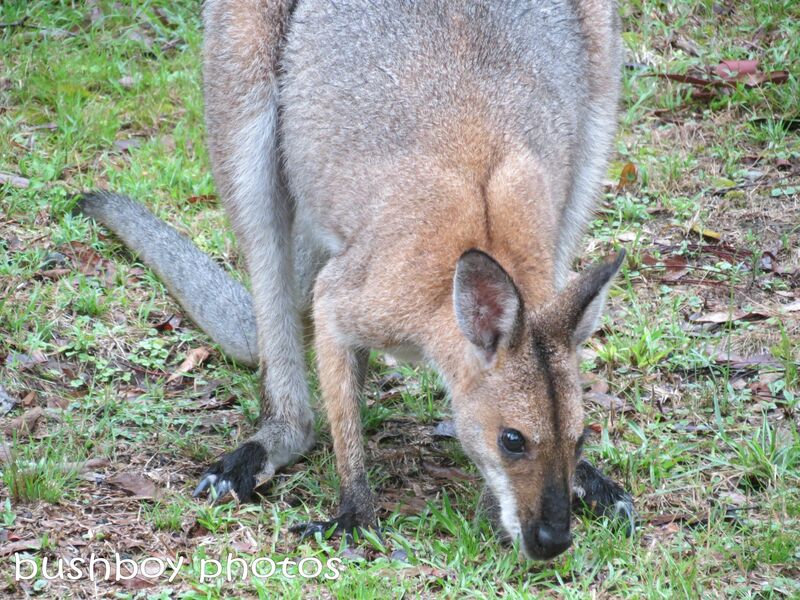 But mostly it’s the wallabies that get attention as they are quite calm around me and they come closer to the house than most other animals. Here is the “Whole lot of Wallabies” part. I couldn’t decide which one to use so I just included a selection of different wallabies, their young and places they hang out. Sometimes they come in groups. The Red Necked Wallabies are everywhere. 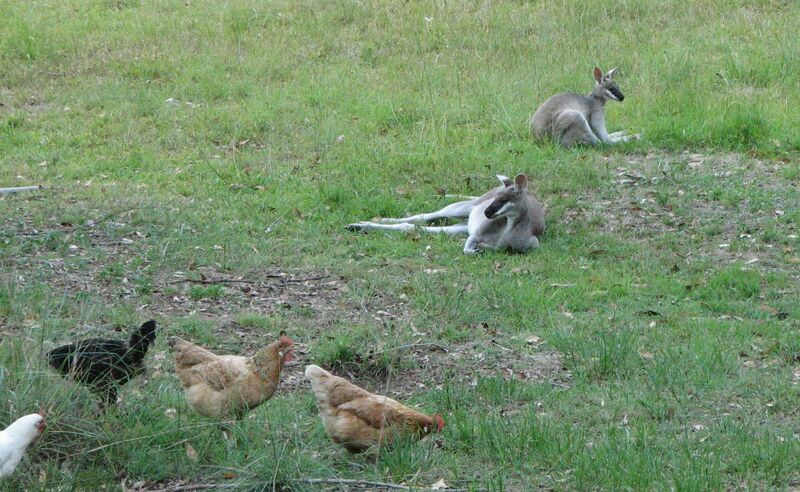 They don’t mind hanging out with the chooks. 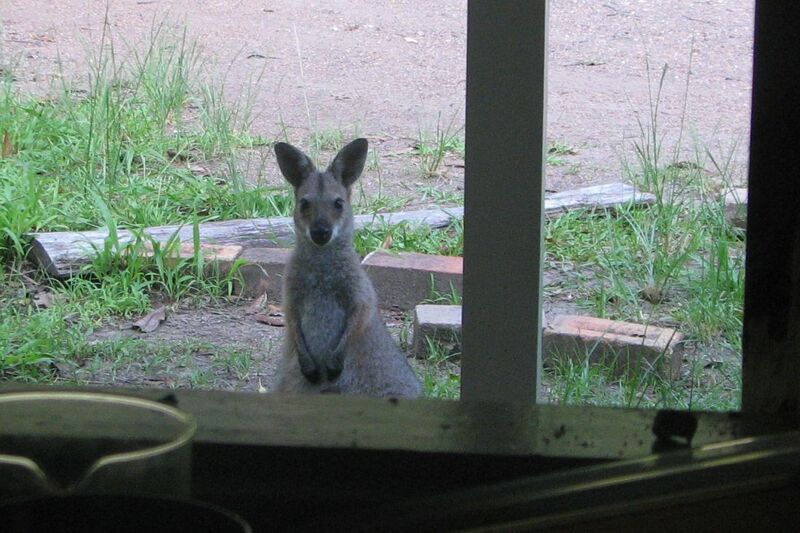 The Whiptail Wallabies, or Pretty-faced, seem to hang out in the back. The Red Necked Males are quite large and in breeding season, the red really stands out. 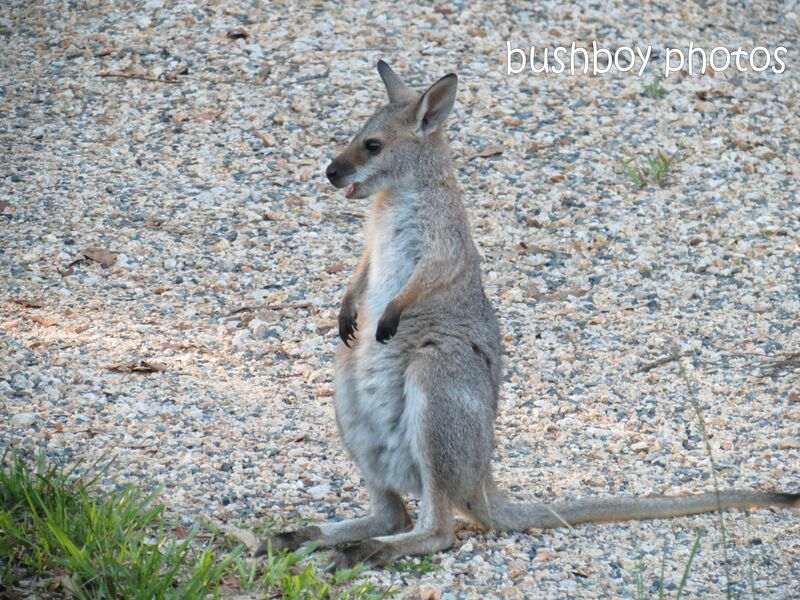 I was lucky enough to get a photo of a very young joey before it grew any hair. 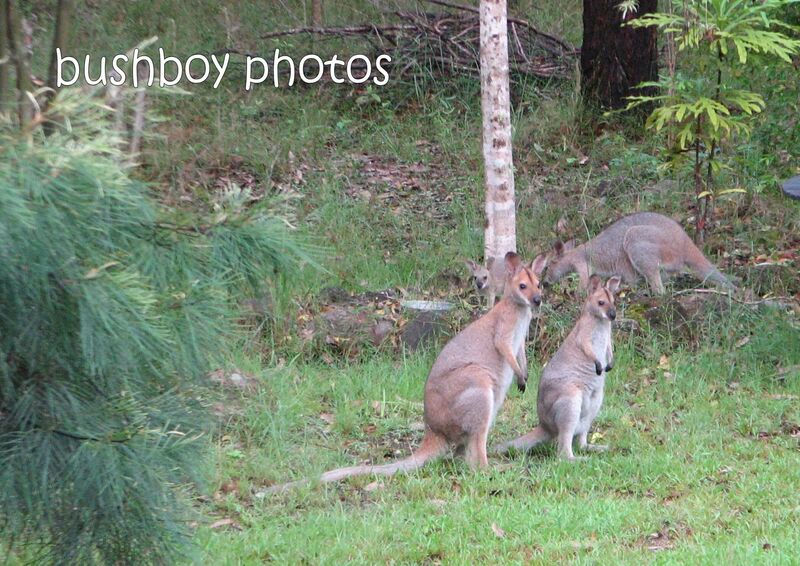 The Joeys are so adorable. Sometimes the come to the front door…..
….and sometimes to the back door. I love the animals that are around my place. Do you have many at your place?